Jellycat London Bashful Bunny Rabbit Plush Tan Brown Baby Lovey Pet Soft Toy 12"
Jellycat Plush Hanging Tan Bunny 1999 5.5"
Bunny measures approx. 5.5" Tall (in hanging postion 8" long) Be sure and have a look at my other Jellycat Plush Toys. A Plush. Tan Colored. Tush tag is attached dated 1999. 2 Jellycat Blossom Bashful Bunnies. Nice set for any fan. MY HOUSE IS SMOKE-FREE NOT PET FREE! Jellycat of London bashful stuffed yellow bunny rabbit. Jellycat of Long bashful stuffed yellow bunny rabbit. Soft plush puppy dog lovey. Jellycat Bashful Bunny Ivory Polka Dot Ears - 12" seated. The plush is in good used condition(examine pics carefully). Jellycat Kitty Cat Plush. Bean pellets in tush. Gently pre-owned with light play wear. Clean and ready for more play! Gray ruffly fur. Made by Jellycat London. Unicorn and Bunny are in excellent condition! And as all Jellycat stuffed animals, they are UNBELIEVABLY SOFT ! Cream White Bashful Bunny Rabbit. White and Pink Unicorn. Iridescent Unicorn Horn. 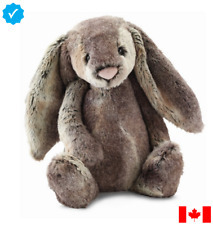 Jellycat Chocolate Brown Bunny Rabbit. Excellent - used but appears to have not been used. Good - shows wear. Fair - shows use and will more than likely be flawed. Wonderful Jellycat made this Orla Ostrich. Very good condition. Jellycat Amuseable Cherry Plush 17"
Jellycat London pink Piper the Bashful Pig--12" size and in clean, very good/excellent condition. "Colorful and Wonderful it's Fuddlewuddle Giraffe! A very groovy guy indeed, Fuddlewuddle Giraffe is always there for a friend in need! This is the original Jellycat Fuddlewuddle Giraffe that is now retired, not the version that is currently available. NWT Jellycat Stuufed Animal Mouse I am Your Little Friend Mouse 9"
Jellycat London Maple Bashful Bunny Plush Stuffed Animal Toy 12"
Jellycat TOOTHY CROC Dino Green Plush Stuffed Animal BIG Teeth Pre-owned 15"
Jellycat is a company that makes different types of stuffed animals. Various kinds of animals are sold through the brand, which includes bunnies, foxes, and giraffes. Soft materials are used to construct each product to be gentle to the touch. What is the Bashful line? Jellycat created a Bashful line, which features woodland creatures that have a shy side and timid facial expressions. The line first launched with the release of one Bashful bunny, but now includes many other creatures like monkeys, penguins, and cats. Each Jellycat monkey, dog, and all other Bashful creatures are constructed out of a soft fabric as well as the details on the body and face for increased comfort and safety. How do you pick a soft Jellycat toy? There are many factors to consider when selecting a Jellycat toy, which includes evaluating the size and how easily a child of a certain age can hold it each day. Size: Jellycat products are available in small, medium, and large sizes. The small size includes those that are up to 14 inches in size. Its medium line ranges in size from 14 to 24 inches. All large products are more than 24 inches in size, including dogs and monkeys. Age of the child: Jellycat makes products that look like a monkey and dogs without any loose parts. Eliminating small parts that are present increases the safety in the design of the product. Type/design: Dogs, monkeys, bunnies, and puppies are some of the main options that are available with the stuffed animals that are sold through the company. Jellycat also makes designs that include lions and other wild creatures. Child's interests: You can select a Jellycat stuffed animal that is the main character from a favourite book or television show. Is the colour of the toy important? Jellycat creates soft toys and animals in a variety of colours to suit both genders and stages of development. Some of the colours are more traditional, which includes a Bashful monkey in brown fabric or a little bunny in pink. Other soft animals feature brighter and bolder colours. How do you choose interactive toys? Shoppers can choose interactive toys when shopping for an infant or child. The Bashful line is created to encourage children to use their imagination and find new ways to play. Cordy Roys from Jellycat is available in a monkey or puppy style with eyes that are stitched onto the face of the animal. Content provided for informational purposes only. eBay is not affiliated with or endorsed by Jellycat.